L. 1. The Bill for Colouring of Customs in other Mens Names. L. 1. 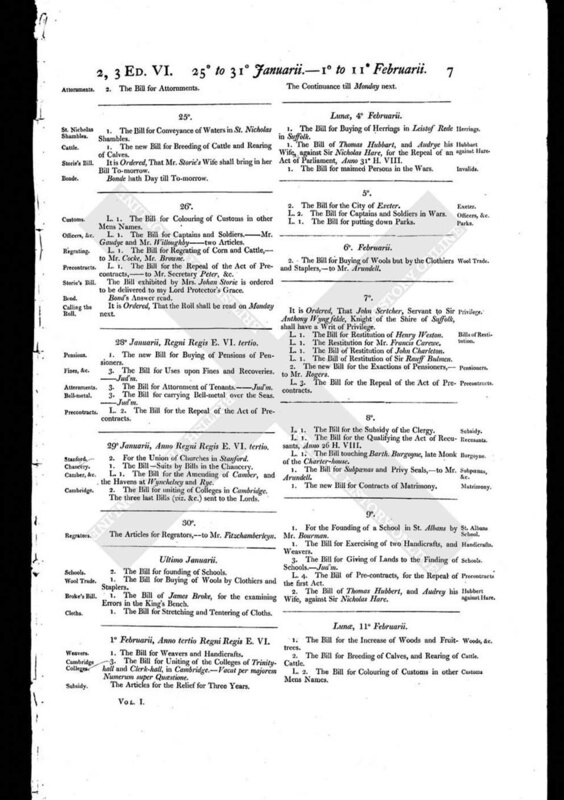 The Bill for Captains and Soldiers. - Mr. Gaudye and Mr. Willoughby - two Articles. L. 1. The Bill for Regrating of Corn and Cattle, - to Mr. Cocke, Mr. Browne. L. 1. The Bill for the Repeal of the Act of Precontracts, - to Mr. Secretary Peter, &c.
The Bill exhibited by Mrs. Johan Storie is ordered to be delivered to my Lord Protector's Grace. It is Ordered, That the Roll shall be read on Monday next.